In one of my last posts, I wrote about the ’’Zwanzig 12’’. As we were sitting outside the restaurant enjoying our cocktails, we noticed a small Asian restaurant in the alley next to us. We were a little surprised that we’d never seen it before. It wasn’t new, but the store is just so small and far of any regularly travelled footpaths that it was easy to miss. Plus, it doesn’t really look like a full-blown restaurant, but rather like the storage unit of another store. At first, that fact made me a little reluctant to try it out; the store did not look very ‘trustworthy’, and I’m usually careful about that when it comes to food, but I was craving some Asian take-out and thought I’d try it anyway. Stepping inside the store did not really help to diminish my feeling of discomfort. The room is very small and quite bleak with its bare concrete walls and simple square cut. 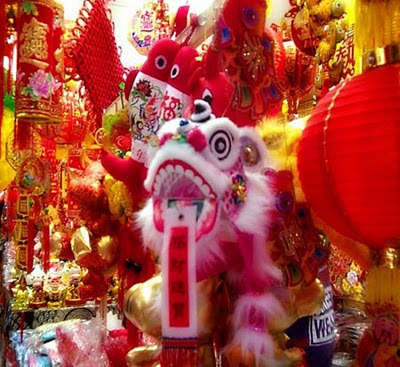 It contained only 4 tables and is decorated with a bunch of cheap and cheesy looking Asian memorabilia. The restaurant was completely empty except for the cook/server sitting in the back of the store, reading a newspaper. There were no flyers or menus indicating the food options, just a little light-up sign above the kitchen, which is actually inside the restaurant and which is only big enough to fit one person. But surprisingly enough, the food variety was larger than I’d expected. You are even given a choice of combining several dishes or creating a new one from scratch. It didn’t take me long at all to figure out what I wanted to order, and the cook/waiter started preparing my dish immediately. And seeing as the kitchen was right behind the counter, I was actually able to watch him prepare it, which I found reassuring considering my first impression of the location. It only took a minute to get my order ready to go; I can’t even remember the last time I got my fast food that fast.The dish turned out to be tasty and was a big enough portion for me not to be able to finish it all. They could probably work on improving the way the food is arranged (just piled up into a yellow Styrofoam box), but considering the price (3€) you really can’t complain. In the end, the little restaurant turned out to be a bit of a surprise for me. I had half expected to go home with food poisoning that afternoon, but instead had a tasty and cheap meal. 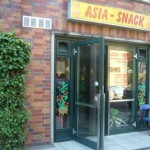 The restaurant is certainly not one of the nicer or higher quality places Rostock has to offer, and it’s not a good place if you’d want to sit down inside and have a nice evening with friends or family, but if you are craving some inexpensive Asian take-out of decent quality with a great individualized variety of dishes, the ‘’Asia-Snack’’ is definitely a valid option. 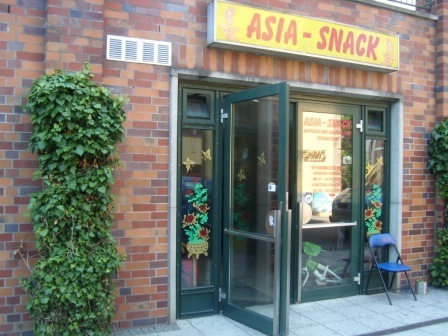 This entry was posted in News, Restaurants, Bakeries & Canteens and tagged Asian Food, cheap, Fast, Take-Out. Bookmark the permalink.